I have been having so much fun working in front of the Children's Museum. Their staff has been extremely helpful, which is great because it makes our job a lot easier and more efficient. Yesterday, we continued our success at both fishing and crabbing! 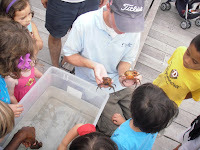 Kids loving playing with the crabs and other creatures in the touch tank, its always a big hit. The best part about fishing in the Channel is we are always at least getting bites. I am always so impressed by how quickly some of the kids learn to fish. Even though we were using large striped bass hooks, the kids still managed to hook two small cunners. We still haven't caught a bass but I hope it will be soon. One of the more enthusiastic anglers, Matthew, even caught a small piece of white siding for a house! It was a very strange find! 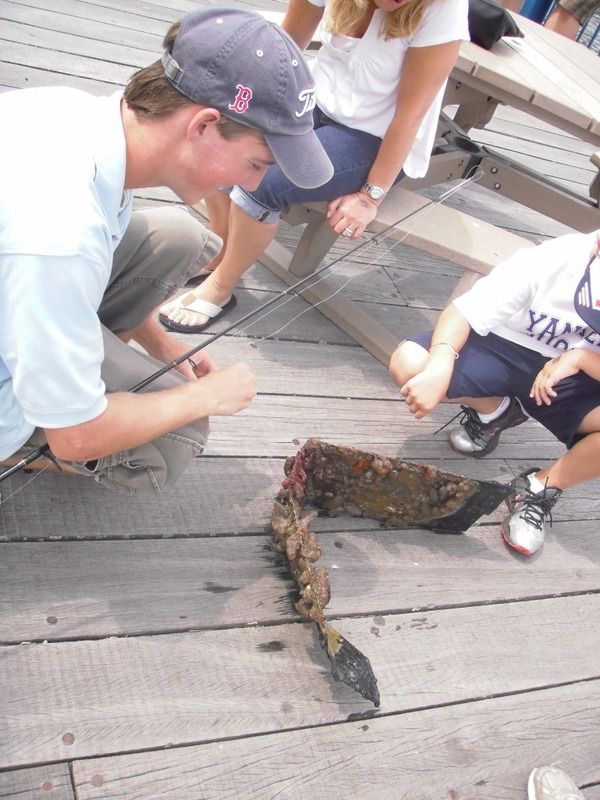 We were able to look closely at the object to find all kinds of marine organisms growing on it like sea squirts, sea weed, mussels, and orange tunicates. We got the added satisfaction of being able to remove one piece of junk from the water. The kids always love playing with the crabs and other creatures in the touch tank, its always a big hit. Overall it was a fun and interesting day, I can't wait to get back there and see what we catch on Wednesday!